Resolvers are absolute analog rotary encoders which are ideal for harsh environments. 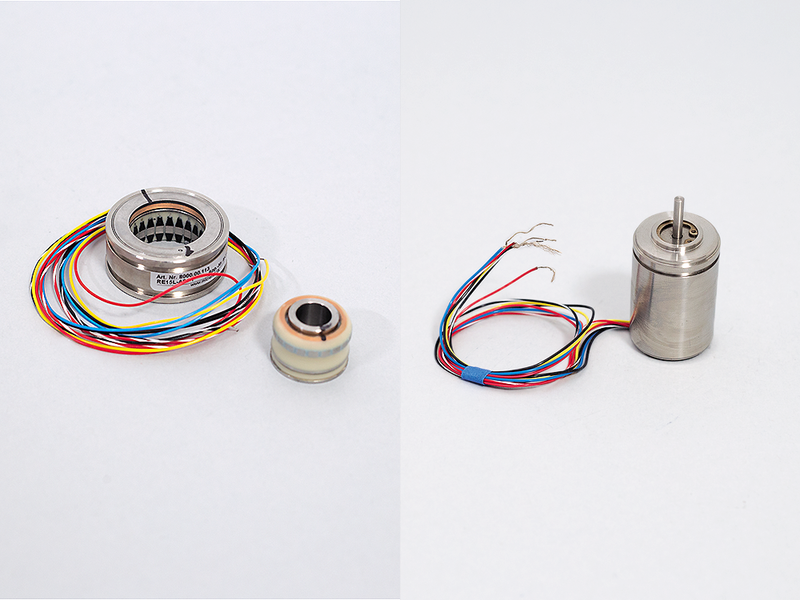 Unlike conventional optical or magnetic rotary encoder (with internal temperature-limiting electronics), the resolver is similar to a transformer in construction and does not incorporate any electronics. An external R/D (resolver-to-digital) interface is required which is also why the resolver can withstand extreme environments (-55°C to +155°C for frame-less resolvers). There are two types of resolvers: Control Transmitter and Control Transformer. The Control Transmitter features single excitation input to rotor input and sine/cosine stator outputs. The Control Transformer resolver requires both sine/cosine reference stator inputs and rotor output is a phase-shifted sine signal. For new designs, the control transmitter type resolver is recommended as commercial R/D interfaces are available from many manufacturers. For board level designs, R/D conversion ICs are available from Analog Devices and Texas Instruments. Selecting a resolver is usually determined by shaft size, excitation frequency (a function of the R/D update rate & resolution requirements) and transformation ratio. Microsyn RE2010 (size 08) / RE3630 (Size 15) / RE5032 (Size 21) / RE7557 (Size 30) are high performance, brushless, frame-less (aka pancake resolvers) ranging from Size 08 (∅0.8-inch or ∅20mm) to Size 30 (∅3.0-inch or 75mm). Larger form factors are also available. Contact the Micronor sales with your resolver requirements. Contact Micronor Sales with your special resolver requirements.